Rainfall in any form will provide some drought relief. A good analogy might be how medicine and illness relate to each other. A single dose of medicine can alleviate symptoms of illness, but it usually takes a sustained program of medication to cure an illness. Likewise, a single rainstorm will not break the drought, but it might provide temporary relief. A light to moderate shower will probably only provide cosmetic relief; its impact is short term. Thunderstorms often produce large amounts of precipitation in a very short time, so most of the rain will run off into drainage channels and streams rather than soak into the ground. Soaking rains are the best medicine to alleviate drought. Water that enters the soil recharges groundwater, which in turn sustains vegetation and feeds streams during periods of no rain. A single soaking rain will provide lasting relief from drought conditions, but multiple such rains over several months might be required to break a drought and return conditions to within the normal range. To view the USGS streamflow information on drought, see the drought map on our WaterWatch site, which shows below-normal, 7-day average streamflow compared to historical streamflow for the United States. Links to additional maps and drought data are listed on our Drought website and the U.S. Drought Portal . 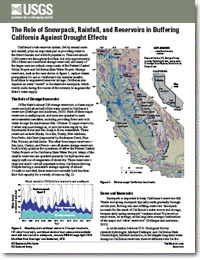 Johannis, Mary, Flint, L.E, Dettinger, Michael, Flint, A.L., and Ochoa, Regina, 2016, The role of snowpack, rainfall, and reservoirs in buffering California against drought impacts: U.S. Geological Survey Fact Sheet 2016-3062, 2 p., http://dx.doi.org/10.3133/fs20163062. 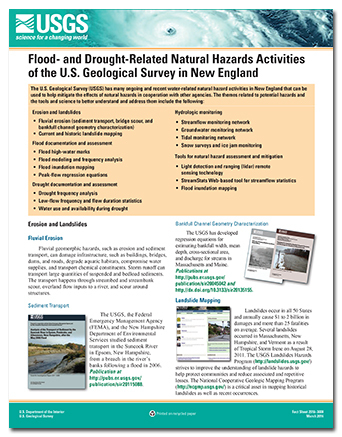 U.S. Geological Survey, 2016, Flood- and drought-related natural hazards activities of the U.S. Geological Survey in New England: U.S. Geological Survey Fact Sheet 2016–3008, 4 p., http://dx.doi.org/10.3133/fs20163008. 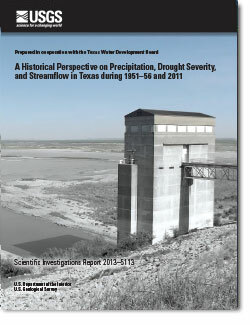 A historical perspective on precipitation, drought severity, and streamflow in Texas during 1951-56 and 2011; 2013; SIR; 2013-5113; Winters, Karl E.
Burkett, Virginia R.; Kirtland, David A.; Taylor, Ione L.; Belnap, Jayne; Cronin, Thomas M.; Dettinger, Michael D.; Frazier, Eldrich L.; Haines, John W.; Loveland, Thomas R.; Milly, Paul C.D. ; Robert, S.; Maule, Alec G.; McMahon, Gerard; Striegl, Robert G.
U.S. Geological Survey climate and land use change science strategy: a framework for understanding and responding to global change; 2013; CIR; 1383-A; Burkett, Virginia R.; Kirtland, David A.; Taylor, Ione L.; Belnap, Jayne; Cronin, Thomas M.; Dettinger, Michael D.; Frazier, Eldrich L.; Haines, John W.; Loveland, Thomas R.; Milly, Paul C.D. ; O’Malley; Robin; Thompson; Robert S.; Maule, Alec G.; McMahon, Gerard; Striegl, Robert G.
Agricultural crops can wither in a flash when the days turn hot, the air dries, the rain stops and moisture evaporates quickly from the soil. A new early warning system can help alert managers and others as drought begins to happen. Drought has left the West parched and thirsty. Families, businesses, and farmers all need water, as do fish, wildlife, and their habitats. A Record of Change: Science and Elder Observations on the Navajo N.
Corn showing the effects of drought in Texas. The surface level of Lake Mead in Nevada and Arizona has fallen to a historic low as 16 years of ongoing drought in the American Southwest continue to impact the Colorado River Basin. A hydrologic technician from the USGS Idaho Water Science Center measures streamflow in Lightning Creek at Clark Fork, ID. The USGS is collecting data at hundreds of sites on rivers and streams in six western states to document the 2015 drought. 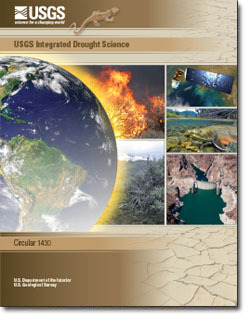 USGS scientists will analyze the data to identify which rivers and streams may be most vulnerable to future droughts.